140 pages | 2 B/W Illus. Daphne Halkias, PhD is a distinguished academic, researcher, published author, and consultant in the areas of international marketing, family business, coaching and mentoring family businesses, organizational psychology, education and sustainable entrepreneurship. She is Professor of Management Research at International School of Management, Paris, France, a Founding Fellow at the Institute of Coaching at McLean Hospital, a Harvard Medical School Affiliate, USA, a Research Affiliate at the Institute for Social Sciences, Cornell University, USA, and Senior Research Fellow at The Center for Youth and Family Enterprise, University of Bergamo, Italy. Dr. Halkias is CEO of Executive Coaching Consultants, and Editor of International Journal of Technology-Enhanced Learning, International Journal of Teaching and Case Studies, and International Journal of Social Entrepreneurship and Innovation. She is a Member of the Family Firm Institute, American Psychological Association, Society for Industrial and Organizational Psychology and Business Fights Poverty. Joseph C. Santora, EdD is Distinguished Visiting Professor of Management and Director of Research and Executive Doctorate of Business Administration (E-DBA) doctoral program at Ecole des Ponts Business School, France. He was a Dean and Director of doctoral studies, and has taught in several doctoral, MBA, and IEMBA programs at business schools in Australia, the Balkans, Europe, Georgia, Russia, Taiwan, the UK and the US. Professor Santora was also an Adjunct Senior Research Fellow at Monash University, Australia. He has written two books, and published more than four dozen refereed articles and teaching cases in ranked journals and 150+ academic and practitioner papers, blogs, cases, book chapters and reviews, along with numerous publishing and presentation awards. His research focuses on coaching, leadership, executive succession and leadership transition in non-profit organizations, family businesses, managing and leading change, and teams. 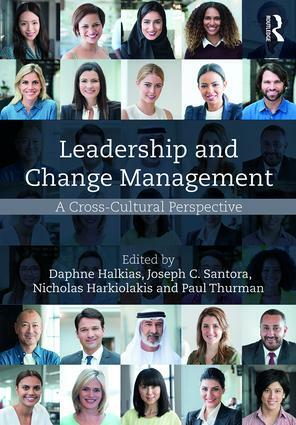 Professor Santora is the founding and current Editor of the International Leadership Journal, an online refereed academic journal devoted to exploring multidisciplinary organizational leadership issues. He has done postdoctoral work at Harvard, Princeton, and New York University, and serves on nine international academic editorial boards. He founded and served as Managing Director of two for-profit companies, and has consulted to more than two dozen non-profit organizations and major corporations in Europe and the US. Professor Santora has also done corporate training for several large multinational companies in Italy and Spain. Nicholas Harkiolakis, PhD is Vice President for Europe and Middle East and Director of Research for Executive Coaching Consultants. He is Editor of International Journal of Teaching and Case Studies and Associate Editor of International Journal of Social Entrepreneurship and Innovation. He is the author of ‘e-Negotiations: Networking and Cross-Cultural Business Transactions’, ‘Multipreneurship: Diversification in Times of Crisis’, and ‘Leadership Explained: Leading Teams in the 21st Century’. He also teaches graduate courses and supervises dissertations at various universities in France, the UK and the US. Paul W. Thurman, DrPH is Professor of Management and Analytics at Columbia University’s School of International and Public Affairs and at its Joseph L. Mailman School of Public Health in New York, USA. His consulting and management experience spans strategic visioning, operations and change management, technology strategy and implementation, and executive coaching. Dr. Thurman has been a Visiting Professor and Research Fellow at leading graduate schools including the London Business School and the Haas School of Business at the University of California, Berkeley, and is CEO of Thurman and Associates, a consultancy he founded in 2000.